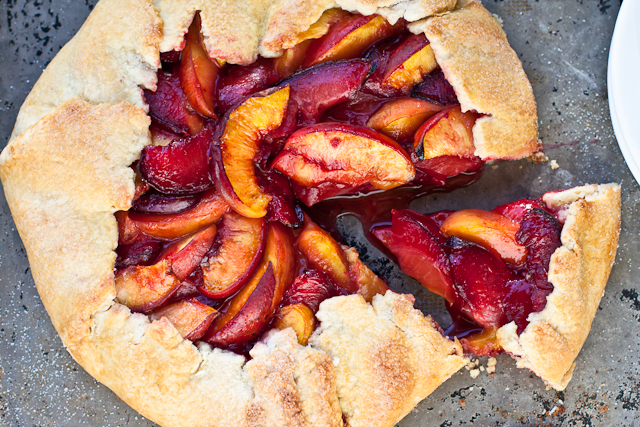 2) Plums get the shaft when it comes to pretty internet recipes. *That is possibly not historically accurate. We’ve talked before about how “galette” was just a fancy French word for throw &^%$ together (as well as another way to consume wine). And if this recipe doesn’t exemplify throwing *&^% together, man, I just don’t know what does. I took three of the ripest peaches I could get my hands on and three of the juiciest plums I could swipe before Landry ate them all. I sliced those up, piled them into a rolled-out pie crust that I found at the bottom of the freezer (while I was making room for another bag of pitted cherries, naturally), and then hit it with an egg wash and a sprinkling of sugar. What went into the oven was an almost-pretty pile of improvisation. What came out of the oven was a beautiful, bubbly concoction wrapped in a flaky, buttery pastry crust. And at about the same temperature if I had grabbed a peach off the tree in the backyard. I used as little sugar as possible. I could tell you that this was to let the natural sweetness of the fruit shine. But that’s kind of a load. What I was really trying to do was save the carby carbs for the ice cream I planned to serve on top. 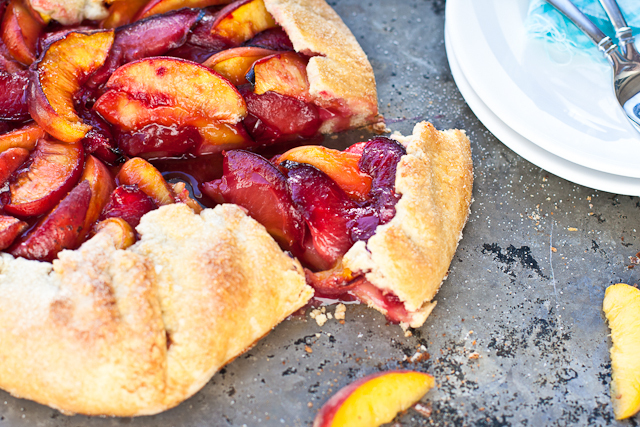 The creamy vanilla ice cream cut the slightly tart galette perfectly for dessert on the patio. Not too shabby for a barely-a-recipe recipe. 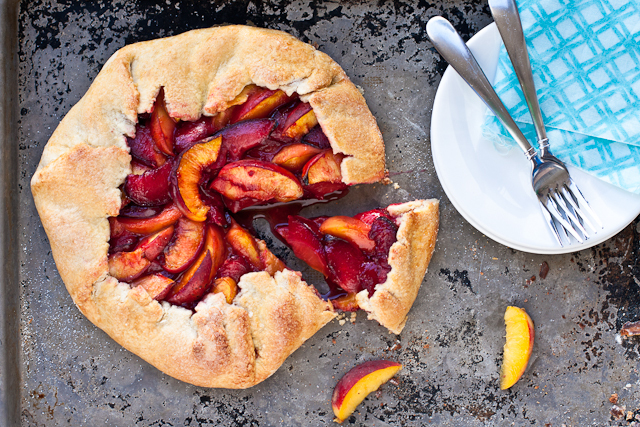 A quick and easy fruit tart highlighting two of summer's best fruits: peaches and plums. Roll out your pie crust on lightly floured parchment paper. Arrange the sliced fruit in the center and working your way out, leaving a ~2-inch border of crust. Fold the crust edges up and over the fruit (you can lift the sides of the parchment to fold the dough over if it has gotten too soft to do it by hand). Transfer the parchment to a baking sheet. Brush dough with egg wash and sprinkle evenly with sugar. Bake for ~30 minutes, until the fruit center is bubbly and the crust is golden brown. Serve topped with a scoop of your favorite vanilla ice cream. Love this flavour combo!! 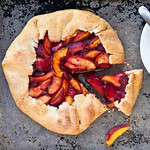 This galette is gorgeous! This is gorgeous! I bet plums & peaches are delicious together! I’m a fan of conserving my calories for ice cream consumption. AND for eating all the stone fruits! Gorgeous galette! This was SO easy and SUPER DELICIOUS. I am loving the peaches and plums and trying to get my fill before the “good ones” are gone for awhile. I cooked it for my own birthday and loved it. I used very little of the sugar on top as the natural fruit is enough sweetness.